Whilst I am not into horse racing, this seemed to be a reasonable title for this Editorial. I guess that “double hat trick” might also apply? As you will see in the article “Portable activations to chase KRMNPA plaques” from Jim Linton VK3PC, two Peters reached significant milestones over the ANZAC Day weekend. I was one of them! So, I am going to indulge myself by giving you an overview of 10 days of my radio activities. At the start of Easter, my SOTA Activator score was sitting at 865. I headed off to Wodonga to visit family, but warned them that I wanted to head into the hills to play radio during the day – I wanted to hit the 1000 point mark to qualify as “Mountain Goat”. That was all OK. I travelled via the Great Alpine Road, with some diversions to activate three summits on Good Friday. I joined Mark VK3ASC and his wife Kathleen on Saturday for three summits near Mount Beauty. Sunday saw me back near Mount Beauty to activate a “new” summit, with another diversion on the way home for a second activation for the day. Monday was spent with Mum, but with a pleasant chat with Warren VK3BYD over coffee at the Bakery in Chiltern, discussing SOTA, followed by some shopping in Albury and then a family dinner that evening. Tuesday and Thursday saw two further solo activation trips into the hills, followed by a joint activation trip with Bernard VK2IB on ANZAC Day. ANZAC Day saw terrific weather. It was somewhat amusing to listen to other activators when the pile ups were running hot – many tripped up whilst trying to use the AX prefix! After the first two summits of the day, I had estimated that my Activator tally was at 999 – one point short of the magic 1000. We headed on to our third summit – a 10 point summit, and our third previously un-activated summit for the day. My fourth contact for the day qualified the summit, so I was then officially entitled to be called a Mountain Goat. Bernard tells me that I had a huge smile at that point. It was even a very comfortable activation, as Bernard supplied folding chairs – a comfort which I rarely consider. Whilst activating our second summit, I worked John VK5BJE/3 in the Coopracambra National Park – one of two parks that I still needed to chase for the complete set of 45 Victorian National Parks for the Keith Roget Memorial National Park Award (KRMNPA). Many thanks, John! I headed for home on Saturday, with a diversion to activate a summit near Bright. When I was back close to Bright, I heard people chasing John VK5BJE/3. However, John was not strong at my location, so I headed out of town. Once away from the noise sources, I could hear John, but he was struggling to hear me. I set up the squid pole and a SOTA antenna on the side of the quiet road, and finally managed to work John, who was in the Errinundra National Park – number 45 for me, so I now had the second leg of what turned out to be a quadrella. Thanks again John! Once at home that evening, I checked my tally sheet for the KRMNPA – I had indeed now chased all 45 parks. I quickly sent off an email to Tony VK3VTH with the summary sheet. I woke early on Sunday morning to see a fine day. I quickly decided that it was a good day for a ferry ride and drove to Stony Point on Westernport Bay. After purchasing the ferry tickets, I had to rush to make the 1015 ferry departure. Once at Tankerton, I walked off the jetty and into the French Island National Park and set up amongst some low trees which provided protection from the wind. I quickly made plenty of contacts, thus qualifying National Park number 45 as an Activator. This was the trifecta (or hat trick, if you prefer). I continued operating and made over 50 contacts in just over two hours, which also qualified the activation of the Park for the VKFF and WWFF schemes. That evening, I sent Tony VK3VTH my activator summary sheet. Tony confirmed that I had activated all 45 National Parks, and had therefore qualified for both the Chaser and Activator plaques for the KRMNPA. Tony reminded me that Amateur Radio Victoria had recently announced a new trophy for the KRMNPA – the Grand Slam plaque for having both activated and chased all 45 NPs. So the ANZAC Day weekend saw me reach four significant milestones over three days. I had not expected to complete the KRMNPA milestones and had seen but forgotten about the Grand Slam announcement from ARV. It was a very satisfying 10 days of radio activity, interspersed with valued family time. I offer sincere thanks to all who have been out in the Parks activating and to all the chasers. And congratulations to Peter VK3ZPF for being the first to achieve the Grand Slam! The VK3JNH team operated from high on the Bogong High Plains for the John Moyle Field Day, experiencing some superb sunsets and sunrises, plus some truly horrible weather which forced them to retreat to lower altitude for Saturday night. Our cover shows an overview of the station. See the story on page 32. Photo by David Warrillow. I’m writing this Comment about 10 days out from the WIA’s Annual General Meeting (AGM) and Conference, being held this year on the Queensland Sunshine Coast, so my mind is focused on reports and statistics. It’s also possibly my last Comment, depending if I am ousted from the position (or not) at the first Board meeting following the AGM! The AGM is actually a very short affair, dealing only with the statutory corporate requirements. The record for the shortest AGM is held by Michal Owen VK3KI (SK), at about six minutes long! The AGM session is followed by the Open Forum, where written reports from the various WIA committees are received and discussion happens between the Board and the members present. The Open Forum is where the real business takes place and substantive issues are dealt with. In the past, published Open Forum reports have only been available from the time of the AGM, but this year, the Board has decided to place the Open Forum Reports on the WIA website in advance, so everyone with an interest has a chance to read them prior to the meeting. The reports contain some interesting statistics that show the health of amateur radio in Australia. Let me share some important ones with you. In 2013, there were 625 new amateur licences issued, (79 more than the previous year, but well below the 813 recorded in 2009), of which 414 were Foundation licences, 118 were Standard and 93 Advanced. The total number of amateur licences at the end of 2013 was 14,190, some 186 less than the previous year and 408 less than in 2009. Silent keys and people moving-on from the hobby appear to be taking a toll. Clearly, the Foundation licence is supporting the hobby to a far greater extent than many realise. If it was not for the introduction of the Foundation licence some nine years ago, with 414 Foundation licences issued last year, amateur radio in this country would probably be in a very different position. Interestingly, after decreasing for a number of years, possibly as pent-up demand washed through the education and assessment system, there was a small upswing in the number of Foundation licence candidates in 2013. The forecasts from doomsayers that amateur radio in Australia is in terminal decline seem to be rather premature (by some 50-60 years!). It’s also interesting to look at the number of WIA members. At the end of 2013, the WIA had 4,538 members, (51 less than the year before, but only two less than in 2009). So, although the amateur population has been falling, the WIA has been able to sustain membership numbers and has actually improved its market share from 31% in 2009, to 32% in 2013. Not that we think 32% is a good number – there is much room for improvement, but it’s a good position from which to work. The WIA Broadcast clocked-up 34,800 RF check-ins and 41,400 streaming downloads, while the WIA website had 11.5 million hits, and the inwards QSL bureau handled 90 kg of cards which, if stacked in one pile, would stand 19.36 metres high! The other interesting statistics we have been looking at recently are the results of the recent Membership Survey. The 834 survey responses received would have to be judged as pretty good for a membership of 4,538 – 18.4% of the total membership – so we should be able to draw some valid conclusions. As Vice President Chris Platt VK5CP said in his preliminary Survey analysis placed on the WIA website: “the most common entry points into the hobby were the old Limited licence (34%) and old Novice licence (21%), followed by the Foundation licence (21%). These results probably reflect the entry-level licence options that were available at the time, and show the importance of the previous Novice, and now the Foundation, licences as feeders into our hobby. Over 50% of respondents upgraded their licence within two years, and almost 70% within the first five years”. Again, this shows the importance of the Foundation licence as a feeder into the hobby. One pleasing result from the Survey was the length of time people have been a member of the WIA, with about 30% of responders being a member for five years or less. Either we are attracting a lot of new members to the WIA, or old members are returning (probably both). Chris is working on a more detailed report that will include the raw survey data. With a view to the future of the Foundation licence, the Board and the Spectrum Strategy Committee have been working through the many issues that need to be addressed to update the Foundation licence conditions, the syllabus and exams. Our goal is to introduce expanded privileges for the Foundation licence during the 10th anniversary of its introduction, particularly digital modes – not only digital voice, but also access to some computer-mediated digital modes. We anticipate that many future newcomers to the hobby will be sourced from the sphere of Hacker-Maker hobbyists who are mainly interested in digital modes and the crossover technologies between the IT and wireless worlds. We anticipate that this work will flow on to the Standard licence, too. Naturally this all depends on the views of the regulator, so no doubt there will be some interesting liaison sessions with the ACMA in the year to come! From time to time we hear the question “what does the WIA do for me?” For anyone reading the Open Forum Reports for 2013, and the Membership Survey results, I’m sure that that question will be well and truly answered. Non-members are also able to view the information on the WIA website, and hopefully some will now see the value in becoming a WIA member. I would like to sincerely thank everyone who has contributed to the WIA over the past year. I’m not a particularly active radio amateur as I don’t have a lot of spare time, but being President of the WIA has been a great honour, and a lot of fun. In particular, I would like to thank retiring Director, Bob Bristow VK6POP. Being a West Australian, Bob has never been backward in coming forward and telling us easterners what he thinks, and together with Onno VK6FLAB, Bob pulled off an excellent AGM and Conference weekend last year in Fremantle. Bob may not be a Director now, but he has not escaped the WIA’s clutches. By the time you read this Comment, the new WIA Board will have met and elected the executive positions. It will also have set a strategic direction and a broad agenda for the next year’s term. I hope to tell you something about that in the next Comment. 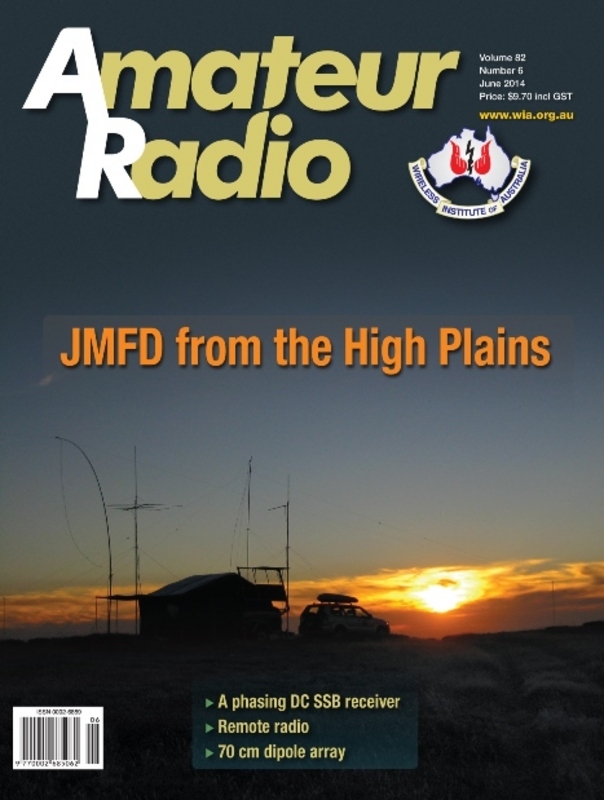 This article is a short report on one team’s effort in the JMMFD 2014, from the rooftop of Victoria, on the Bogong High Plains, an adventure cut short by the foul weather encountered and the subsequent decision to place common sense and safety above all other considerations. A recent upsurge in portable activity, that encourages activation of national parks, and the growth of SOTA, among other outdoor activities, all of which encompass the several domestic awards supporting such activity, and possibly influenced by a similar activity level in the same areas of interest, in a number of overseas countries, has led to a number of significant achievements being attained, and this article nicely details these achievements, certain to be the start of many further awards being issued. The article explains the rationale behind its development, and the process for fabricating it. For those who like to build, have appropriate computer and electronic skills, play in the digital modes area of amateur radio and enjoy the output of their homebrew efforts all the while saving a little bit of money along the way, this will be an interesting read. This is another interesting contribution from this prolific author/homebrewer, this time examining the practical capabilities of designing, building and maximising the performance of a phased direct conversion receiver. This article will be of interest to all those amateurs who enjoy the challenge of building electronic equipment and, perhaps, maximising performance even beyond that of the design unit.